McMaster University will soon be home to Canada’s only small-angle neutron scattering (SANS) instrument. SANS technology is used to study the structure of a variety of materials at an atomic level, from complicated polymers to cholesterol molecules. The $9-million instrument and neutron beam hall at McMaster – dubbed MacSANS – was funded by the Canadian Foundation for Innovation, the Ontario Innovation Trust and the university. The SANS instrument will allow researchers to study materials on length scales ranging from the distance between atoms ( about 0.2 nm) to about 100 nanometers, the size of polymers or proteins or magnetic domains. A human hair is about 75,000 nanometers thick. Construction was recently completed on the SANS neutron beam hall, the building that will house the instrument. It was built to the exact specification of National Research Council Canada researcher Zin Tun. The new facility is an addition built on to the Nuclear Research Building. Bruce Gaulin, director of the Brockhouse Institute for Materials Research and the lead researcher on the SANS proposal, cut the ribbon for the building with Chris Heysel, McMaster’s director of nuclear operations. “We wanted to acknowledge the unpleasantness that building occupants went through during construction, and thank them for their patience,” Heysel says. Next up is assembling and installing the actual components of the instrument, which are being custom-made in Hungary and the NRC machine shops in Ottawa and will be shipped to McMaster in pieces by the end of the year. Researchers hope to start experiments and studies in 2019. McMaster University will soon be home to Canada's only small-angle neutron scattering (SANS) instrument. SANS technology is used to study the structure of a variety of materials at an atomic level, from complicated polymers to cholesterol molecules. The $9-million instrument and neutron beam hall at McMaster - dubbed MacSANS - was funded by the Canadian Foundation for Innovation, the Ontario Innovation Trust and the university. "The SANS instrument will reinforce McMaster's position as Canada's nuclear university," says Chris Heysel, director of nuclear operations. "We expect dozens of different research groups - on campus and from around Canada - to use it." The SANS instrument will allow researchers to study materials on length scales ranging from the distance between atoms ( about 0.2 nm) to about 100 nanometers, the size of polymers or proteins or magnetic domains. A human hair is about 75,000 nanometers thick. Construction was recently completed on the SANS neutron beam hall, the building that will house the instrument. It was built to the exact specification of National Research Council Canada researcher Zin Tun. The new facility is an addition built on to the Nuclear Research Building. 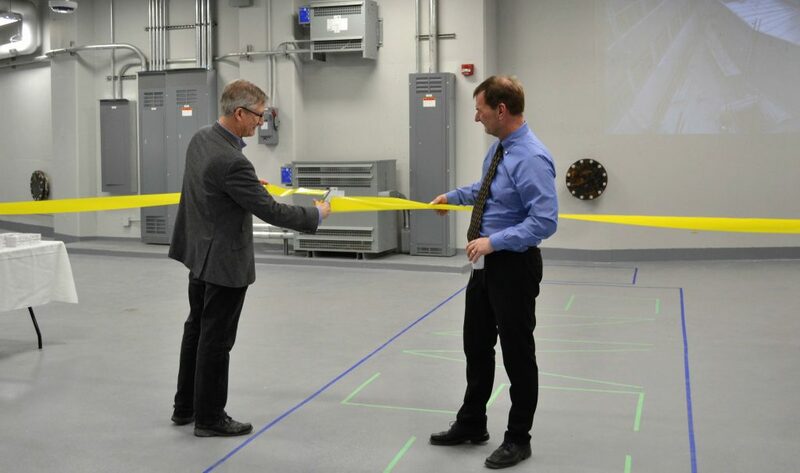 Bruce Gaulin, director of the Brockhouse Institute for Materials Research and the lead researcher on the SANS proposal, cut the ribbon for the building with Chris Heysel, McMaster's director of nuclear operations. "We wanted to acknowledge the unpleasantness that building occupants went through during construction, and thank them for their patience," Heysel says. Next up is assembling and installing the actual components of the instrument, which are being custom-made in Hungary and the NRC machine shops in Ottawa and will be shipped to McMaster in pieces by the end of the year. Researchers hope to start experiments and studies in 2019.